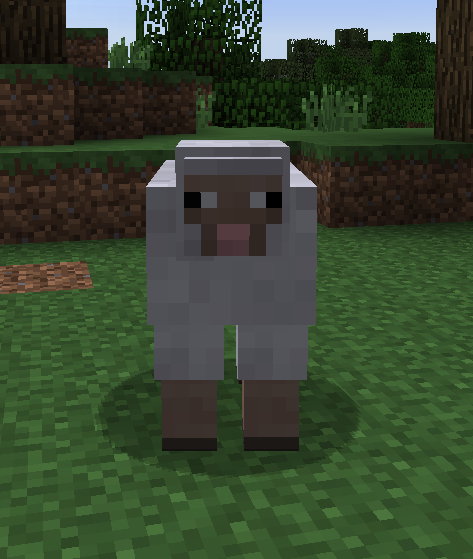 Sheep are mobs that do not attack that can spawn on grass in the Overworld. If a Sheep is killed it will drop 1 Wool that depends on the sheep, and up to 3 experience points. You are also able to Shear a Sheep that will drop up to 3 Wool. The Sheep will eat grass around it, which will regrow the Wool again. You are also able to change the color of the Sheep by using Dye on the sheep, which will result in the Wool dropped being that color. This is very useful for players that need a large amount of Wool and do not have all the supplies to make them. They can just farm a Sheep to get everything. Players usually keep Sheep in a Fence for their Wool, but you will need to remember that Wolf will try to eat the Sheep. Wolf usually spawn in forest and taiga biomes in the Overworld.